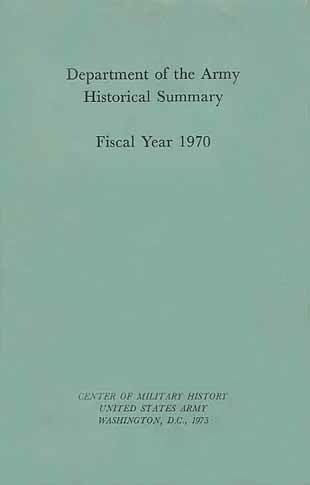 This fiscal year 1970 summary of Army expenditures, work, and accomplishments is the second annual edition to be published separately by the Army following cancellation in May 1972 of the Annual Report of the Department of Defensea document which for two decades had incorporated the annual reports of all of the service secretaries. Continuation of the Army report sustains a document published annually since 1822, one whose earlier editions dating from 1792 were brought into print in 1832 in the military affairs volumes of American State Papers. Those seeking the broad context of the military establishment that was formerly available in the consolidated Annual Report of the Department of Defense are referred to the annual posture statements of the Secretary of Defense. As those reports deal with future requirements rather than past accomplishments, annual editions of the Department of the Army Historical Summary should be consulted for the details of expenditures, work, and accomplishments that pertain to the Army.